A Spincast reel is no longer just an entry level fishing reel, although they do still serve that purpose as well. Instead, they can also be used for general fishing needs. 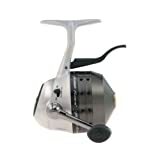 Most of the best modern spincast reels offer high performance as well as high quality, so whether you, a child, or a friend needs a new reel, it’s worth taking a look at these types of reels. In this article, we will be searching for the best spincast reel on Amazon. 1.1 What is a spincast reel? What is a spincast reel? 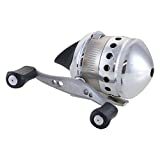 A best spin cast reel is a certain type of fishing reel in which the gears and line are all enclosed, and you press a trigger to allow yourself to cast. They make fishing very easy since there is no bail to shut like spinning reels and no thumbing of the spool like baitcasting reels. It’s literally as simple as putting line on it, pressing the trigger, casting, and reeling. This makes a pro spincast reel ideal for beginners, but modern options have opened this market up a little! 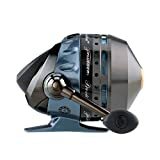 So, what is the best spincast reel for 2019? There are many different options on the market today, but we will give you what we consider to be the top five high quality spincast reels below. Choosing a Spincast Reel for the first time? Click here! Zebco is the most well-known spincast reel maker on the planet, so it makes sense that the best spincast reel would come from them in the form of the Omega Z03PRO. The Zebco omega spinning reel is probably a huge step up from any spinning reel you’re currently fishing with, in terms of performance, durability, and smoothness. 6 Ball Bearings – Zebco says this is the first ever 6 ball bearing spincast reel. Ball bearings are what help a reels smoothness, and 6 is a good number for about any reel! This would make this one of the smoothest reeling and casting spincast fishing reels on the market. Adjustable Handle – The handle can be switched for either right or left handed reeling. Aircraft Grade Aluminum Covers – The covers are made from high quality aluminum for lightness and durability. Gear Ratio – The gear ratio of this reel is 3.4:1, meaning that for every full crank of the handle, the spool will turn 3.4 times, and reel in a solid 19 inches of line. Weight – It weighs in at 10.6 ounces. The Omega Z03PRO is currently the pinnacle in the spincast fishing world. If you want a quality, durable reel, this is it! 5 Ball Bearings – This helps make the 33 Platinum a smooth reeling machine! Gear Ratio – 4.1:1 is a higher speed gear ratio for a spincast reel. In fact, this would make it tied for the fastest reeling spincasting reel on this list, and it picks up 22 inches of line per crank of the handle. If you are fishing faster moving lures, this is the reel to go with. Adjustable Handle – The handle can be switched from either left or right hand retrieve. All-Metal Body and Handle – The body and handle are both made out of solid metal for durability. Pre-Spooled – This reel comes with 10 lb Cajun line already spooled onto it so you don’t have to worry about it. All in all, if you are looking for a smooth, fast spincast reel at a great price, this is one of your best bets! Zebco has long been one of the best manufacturers in the world of spincasting reels. Taking third place is the Pflueger President spincast reel. Perhaps you’ve heard of their good spinning reel counterparts, also called the Pflueger President. That is one of the best and most popular spinning reels on the market, and it appears this model is no different! 4 Ball Bearings – The President has a solid 4 four ball bearings, helping make it a smooth spincasting experience. Gear Ratio – This reel has a gear ratio of 3.8:1, reeling in about 18.5 inches of line per crank of the handle! Weight – It weighs in at 11.2 ounces. 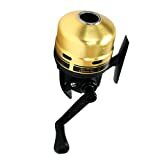 Aluminum Frame and Cone – The majority of the exterior of this reel is made from high quality aluminum. If this reel is any bit as good as the brand Pflueger’s other “President”, you’ll have a top notch reel on your hands. Here’s a neat little spincast reel – it’s actually built to be mounted on a spinning rod and fished downwards! You squeeze the trigger and then cast just like a normal best spinning reel with this one. Pflueger also offers a spinning reel counterpart for this reel called the “Trion” as well, and it’s a quality reel. This reel is a little cheaper than the President but also offers great performance. Heavy Duty Metal Gears – This reel is made with heavy duty metal gears as well as an aluminum cone and handle. 2 Ball Bearings – This reel has two ball bearings. If you are looking for a solid underspin spincast reel, this will do the trick! Gear Ratio – The gear ratio on this series is 4.1:1, which is fast for a spincast reel. Depending on the model you choose, it will pick up between 18.3 and 21.3 inches of line per crank of the handle! Ball Bearing – This reel has one ball bearing. Reviews say that this reel lasts a long time and is built well. The Daiwa GoldCast is definitely one of the best spincast reels you’ll find. Thanks for reading our list on the best spincast reel. I hope you were able to find the best spincast reel for yourself among it! A great spincast reel can make fishing a blast whether you are a beginner or a grizzled veteran. So what are you waiting for? Go out there and get fishing!